The Líl̓wat Nation are an Interior Salish people who live in a stunning and dramatic landscape with a rich biodiversity — a mysterious place of towering mountains, ice fields, alpine meadows, white-water rivers, and braided river valleys that run to a milky colour due to the silt and clay deposited by glacial melt. Líl̓wat is a separate and distinct nation with cultural and kinship ties to the St̓át̓y̓emc. 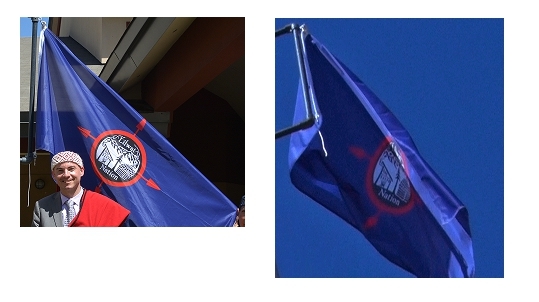 Flag reconstructed after the photograph is the band logo on blue.